Foodservice Packaging Institute’s 2015 Trends Report shows overarching themes of sustainability and customization across the packaging supply chain. FPI's 2015 Trends Report highlighted industry opinions that largely focused on environmentally friendly packaging and customization techniques to differentiate products. We create this Trends Report each year to help our members understand what’s driving sales so they can take advantage of these opportunities and support the changing needs of their customers. The Foodservice Packaging Institute’s 2015 Trends Report searches for common threads found throughout the entire foodservice packaging value chain — from raw material suppliers, packaging manufacturers, distributors and operators. This year’s report, a result of FPI’s annual Trends Survey, highlighted industry opinions that largely focused on environmentally friendly packaging and customization techniques to differentiate products. Packaging: Environmentally friendly or sustainable packaging remains a long-term overall trend. Specifically, compostable packaging was mentioned in an overwhelming number of responses. Other trends include the shift to a more natural look through the use of “Kraft” paper over bleached paper to promote the belief that “brown is the new green.” Conversely, another trend of note includes an increase in graphics and color as operators recognize the opportunity to promote their brand on packaging. Raw materials: “Green” packaging is apparent in raw materials, as different resins and papers are trending based on both the real and perceived environmental advantages of those materials. Machinery: In the machinery used to manufacture foodservice packaging, the desire for highly automated machines that run faster, more efficiently and at lower costs continues — but with little innovation in the industry. Distribution: Consolidation remains a major trend in foodservice distribution (despite the halted merger of the two largest foodservice distributors), along with SKU rationalization and increased competition from small- and medium-sized distributors. Operations: In a continued effort to stand out and differentiate themselves from competitors, foodservice operators are increasingly choosing customized food and beverage items, as well as their associated packaging. Other major trends include increased breakfast business, “grab and go” items and smaller portion sizes that reflect the consumer snacking trend. The survey was distributed in September, collecting opinions from companies in the raw materials, machinery, packaging, distribution and operations sectors. The report contains two sections: the first lists direct comments and insights by industry players and the second compiles the data with additional insights from FPI staff. 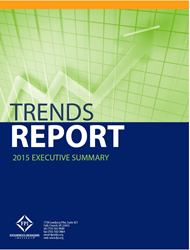 Now in its seventh year, the Trends Report is available to FPI members. Non-members may view an executive summary online. The Foodservice Packaging Institute’s 2015 Trends Report searches for common threads found throughout the entire foodservice packaging value chain. Founded in 1933, the Foodservice Packaging Institute is the leading authority for the North American foodservice packaging industry.